Australian flow battery maker Redflow is raising AUD $14.5 million (USD $11.6 million) as it eyes a new sales opportunity in South Africa. Specialized Solar Systems, a South African microgrid developer, is evaluating Redflow’s ZBM2 products in place of lead-acid batteries for 300,000 remote dwellings over the next five years, according to a Redflow investor presentation released this month. “Technical verification of the solution is underway, with trials planned for this calendar year ahead of field deployments in early 2018,” Brisbane-based Redflow stated. The presentation was issued as part of an effort to raise cash on the Australian Securities Exchange, where Redflow has been listed since 2010. The fundraising involves a share placement of AUD $10.5 million (USD $8.4 million) and the issue of $4 million (USD $3.2 million) of shares to an entity linked to executive chairman Simon Hackett, in exchange for already issued convertible notes, said a Redflow press release. The first tranche is complete, and the second will need shareholder approval at a meeting in August. Just over a tenth of the proceeds will go toward moving Redflow’s manufacturing to Thailand, where it will be handled by precision tooling specialist Microlead Precision Technology, an existing Redflow supplier. The move, which should be complete by December, will help Redflow shave 10 percent off manufacturing and delivery costs as it attempts to reduce total costs by 30 percent over the next 18 months, the company said. The cut should take USD $2,880 off the ZBM2’s current list price of USD $8,000, investors were told. At the same time, Redflow is withdrawing from the U.S. and European markets to focus resources on Oceania and South Africa, where the company sees potential to replace lead-acid batteries for off-grid applications. Around 634 million people in sub-Saharan Africa do not have grid access, the company noted, and the continent spends $27 billion a year just on kerosene, candles, battery torches and other means of off-grid lighting. Along with looking to tap this market through a partnership with Specialized Solar Systems, Redflow is hoping to ramp up sales within the Asian telecommunications market. Asia has more than 2.7 million telecommunications towers, many of which are off-grid or suffer from problems with electricity supply. Each could potentially use up to four Redflow zinc-bromide flow battery units in place of lead-acid batteries. Compared to lead-acid, Redflow says its ZBM2 products have better depth of discharge, more lifetime storage capability, no damage if fully discharged, higher temperature endurance, less risk of fire, easier parallel configuration, smarter controls and greater capacity for recycling. 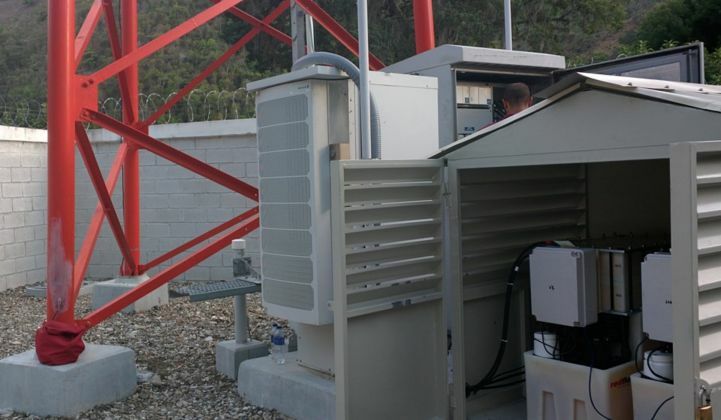 A big plus for the flow battery design, particularly in the hot countries that Redflow is targeting, is that it does not suffer from performance loss at high temperatures. Increasing the operating temperature from 25ºC to 42ºC would cut the lifespan of a lead-acid battery from 10 years to one, according to Sandia Labs research cited by Redflow. A ZBM2, on the other hand, would see no reduction in operating life. Despite these technical benefits, Redflow has faced numerous troubles in recent months. In April, the company halted residential deliveries after some of its ZBM2s developed faults. “We consider the technical problems resolved at this point,” said Hackett, after Redflow replaced some batteries under warranty and issued "over-the-air" software updates to others. As part of a strategic review, Redflow subsequently announced a switch in focus away from the Australian consumer market. The highest-volume sales opportunity for the business was in displacing lead-acid batteries from the telecommunications and commercial and industrial sectors, “which is, and always has been, the heartland market for Redflow's technology,” he said. Redflow is still selling into the high end of the consumer market at “a sufficient level to consume all current product supply,” Hackett said. Redflow expects to have sustainable cash-flow-positive operations by the end of 2018, he said.